This article is about the quest. For the item, see The Black Star (item). Help find and repair Azura's Star. Go to the Shrine of Azura. Speak with Nelacar in Winterhold. Give the star to Aranea or Nelacar. Cleanse the star from within. All over Skyrim, innkeepers will readily tell you about the Shrine of Azura, a monument built by the Dunmer after they fled Morrowind. Additionally, an encounter with the wandering Dunmer Faldrus will point you in the same direction, so make your way to the shrine; it is located in the snowy mountains south of Winterhold. The gigantic statue faces south atop a mountain and a long staircase. The only remaining worshipper at the Shrine, the mage Aranea Ienith, will claim that your arrival was expected, as Azura herself foresaw it and transferred the knowledge to her. The prediction involves a "fortress endangered by water, yet untouched by it" and finding an "elven mage able to turn the brightest star as black as night". Aranea will admit her description to be more cryptic than useful and will direct you to the snowy town of Winterhold for clues. 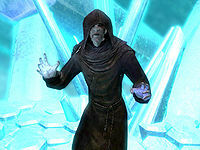 In Winterhold, numerous people can help, directing you to talk to a mage named Nelacar. However, it's not necessary to speak with them, so it's fastest to simply go straight to the Frozen Hearth and talk to him directly. Nelacar will provide the information that you seek, while reluctant at first, thinking you another applicant for the College of Winterhold. If you reveal yourself as an agent of Azura, you will have to pass an easy-level Speech check or he will dismiss you outright. He will not say no to a bit of coin either, and will break down if you intimidate him (see bugs section). A priestess of Azura sent me. (Persuade) Passed: Azura? Gods, it's all finally coming back to haunt me. Look, I'm willing to pay. (Bribe) Passed: A few coins for my soul? If only you understood the irony. I didn't agree to anything. Talk. (Intimidate) Passed: Just calm down. I'll tell you everything. Either way, he will quickly ask you what you know about soul gems and provide a quick introduction, stating that they all break after use, except for one. He will then tell you the story of one Malyn Varen, a former teacher at the College, who examined the Daedric artifact Azura's Star along with a few colleagues and students. Nobody knew that Malyn was actually ill and dying and was using the Star to save himself. But by trying to make himself immortal, he lost his sanity in the process. One day, the experiment escalated to the point where Malyn killed a student and attempted to use her soul for research and, as a result, was banished from the College. He, along with a few loyal disciples, moved to the secluded depths of Ilinalta's Deep. Nelacar will finish with a plea that you don't return the Star to Azura. His request will be left hanging, as you can do nothing but travel to Ilinalta's Deep and search for Malyn and the Star. What turned Ilinalta into Ilinalta's Deep remains a mystery, as the entire fort suddenly sank into Lake Ilinalta with only the rooftops sticking out of the water. According to local legend, the place is cursed and travelers are known to go missing. Upon entering, the earthly remains of a Fisherman, his bones still in shackles, will welcome you. Examine his knapsack for a journal and some minor loot, then proceed forward and take a left at the waterfall. Not surprisingly, given the background story provided by Nelacar, the inhabitants include necromancers and their Undead allies, so be on the lookout for rare ingredients and potions. The fourth room, almost completely flooded, contains two necromancers and an underwater chest. 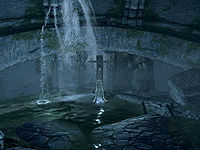 Two water-soaked sleeping areas follow, with the second one containing the Alteration skill book Breathing Water (floating or on the ceiling, in a side room whose entrance is underwater), and the last containing the Enchanting skill book A Tragedy in Black, an alchemy lab, and an arcane enchanter, along with a locked door hiding minor loot. The next area includes a necromage, who will use frost spells, and a resurrected bandit on the other side of a pond. Dispose of the opposition, locate a nearby chest for some treasure, then pull the chain on the wall. This not only lowers the bridge behind you, it also provides access to the second zone further ahead. Stairs down the east wall into the water lead to a locked door, behind which potions and a chest are to be found. Take the western exit, and consider unlocking the door for a few potions. Proceed forward, remove the bar from the door and reenter the very first chamber of the zone, this time on a different level. You can now easily gain access to the second zone through the northern door, and a new bridge leading downstairs will make future exploration much easier. "More souls are needed for the Star. The last one died before he could be harvested." "We can't take another villager from the surface so soon. I told you to prepare everything properly!" "We can just sacrifice another disciple. Apprentice Haerlon will be no great waste." Dispose of them and look around the area for a few soul gems and the Conjuration skill book The Doors of Oblivion. A few potions can be found behind the eastern door, while the western tunnel leads to an imprisonment area guarded by a skeleton and yet another necromancer. 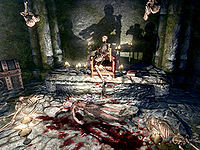 In the final chamber, a boss-level necromancer will quickly reanimate three skeletons; after the fight, head up the stairs where you will find a dead bandit lying in her own blood, the earthly remains of Malyn Varen, along with his revealing Grimoire, a boss-leveled chest, and Azura's Star, currently broken due to Malyn's experiments. Taking the Star on the floor next to the dead bandit has no consequences, other than a choice: either bring the Star to Nelacar in Winterhold or to Aranea at the Shrine. If you return to the Shrine, you will speak to Azura. She will tell you that it is unusable until you have purged Varen's soul from the star. Likewise, Nelacar will tell you the same thing. The difference is the Star's use afterwards. If you bring it to Azura, you will be able to use it to trap any sized soul except for black souls (i.e., souls from NPCs). If you bring it to Nelacar, you will be able to trap all souls, including black, though Nelacar tells you that it can only trap black souls (see bugs section). When you return to the Frozen Hearth, Nelacar will be astounded that you managed to bring back the Star, but will soon realize the exact reason for the many disappearances in and around Ilinalta. Malyn Varen now resides inside the Star, but needs more and more souls to stay alive, which were provided by his disciples until now. After a bit of examination, Nelacar will see the opportunity to finish what he and Malyn started all those years ago, and will suggest that you cleanse the Star. If you accept, he will trap your soul and send you into the Star to confront Malyn. Head back to the Shrine of Azura, and an eager Aranea will immediately take the broken Star from you, then invite you to communicate with Azura. Place your hands upon the altar, and Azura will speak from the planes of Oblivion. She will say how grateful she is to see the Star returned, but will also provide the bad news: due to Malyn's occupation of the Star, the artifact will be useless to you until you venture inside and banish Malyn's soul by defeating him. Once you are ready, Azura will promise to watch over you as you are transported inside the Star's realm. Once you have made your choice, you will be transported inside the star to battle Malyn Varen. The interior of Azura's Star is a light-blue, surreal world with spikes and chiming sounds. Malyn will be waiting for you just inside, eager to feast on yet another soul; he will, however, quickly realize that something is wrong and rush further into the Star, throwing a few leveled Dremora at you. The interior offers very little to hide behind, making stealth a difficult option for combat. It is not possible to fall over the ledges, so proceed forward and remember to collect the valuable Daedra Hearts from fallen enemies. 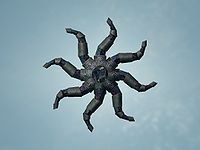 Once you have defeated Malyn, depending on your earlier choice, the Star will turn either black or white and you will be returned to your mortal body in Skyrim. If you went with Aranea, you will be given the restored Azura's Star, capable of capturing White Souls. Additionally, Azura will set Aranea free and she may become a follower. If you went with Nelacar, you will receive The Black Star. 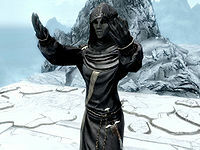 If you have a bounty in Winterhold, Aranea Ienith will be hostile to you, due to her membership in Winterhold's crime faction. This can make it impossible to initiate or finish the quest. Simply clear your bounty and you can proceed as normal. As a radiant AI response upon completing the quest two necromancers may hunt you down. One of them carries a scrawled note which reads: "Malyn Varen's death will not go unpunished. Find the holder of Azura's Star and enact vengeance, or it will be your souls I rend for my enchantments." Some people will comment if you have Azura's star in your possession. Nelacar will say: "I don't like doing business with Azura's faithful... make it quick." Town guards will occasionally comment, saying "By Shor, is that... is that Azura's Star? How did you come to possess such a rare treasure?" If you choose the Black Star option and then return to the shrine, Aranea will threaten to kill you for defiling the artifact, saying "Leave this shrine, blasphemer, before I kill you for defiling Azura's artifact." However, she will never physically assault you. The fight inside the star may be quite difficult, depending on your character. A high Sneak skill or a lot of magic resistance can be helpful, but the inside of the star is considered well-lit, making sneaking difficult. The Atronach Stone, or the Atronach perk helps greatly, since the enemies you encounter here rely mainly on spells in combat. 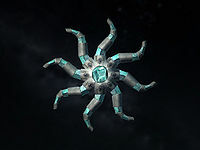 It is possible to defeat Malyn before he can flee further into the star by immediately exiting conversation with him and using an attack that paralyzes or staggers him, such as a power attack, a spell or poison with a Paralyze effect, or Unrelenting Force. This is especially useful if you are having trouble dealing with the magical damage this location's foes throw at you. It is possible to reach Ilinalta's Deluge by using Whirlwind Sprint at the highest rock nearby. If you retrieve Broken Azura's Star before starting the quest, you can give it to Nelacar but not Aranea Ienith. Once you kill Malyn Varen you will be pulled out of the star, so be sure to loot all desired items from him and the other foes as soon as possible. Even if you trap Malyn Varen's soul when you kill him, Azura will still say, "My Star has been restored and Malyn's soul has been consigned to Oblivion. You have done well, mortal." Nelacar's persuasion check compares against his own Speech skill instead of yours, and so will always fail, unless wearing the Amulet of Articulation. If you talk to Dagur after you speak to Nelacar and inquire about a mage who studies stars, the quest will add an objective to talk to Nelacar. Since you already have, you can not get the quest to update that point because the proper options are already gone. It does not appear that this prevents you from progressing with the previously added objective of finding the star. Despite the Black Star's supposed inability to collect white souls, it can actually collect any soul. A boulder meant to prevent access to the second zone of Ilinalta's Deep will occasionally still be present, even during the quest. The only known fix is to exit and reenter the ruin. ? Even after completing The Black Star, this quest can be restarted and reenter the journal. If this happens, it cannot be completed, as talking to Aranea Ienith again at the Shrine will not advance it further. If you are killed by a dremora in the Star after killing Malyn Varen, you might spawn at your last save with both the repaired Star and the broken Star in your inventory. ? When you approach Malyn Varen, you may not be able to pick up the star. Also, at the end of the quest, you may not be given the star. Reloading a saved game should fix this. The bug when approaching Malyn can also be fixed by adding a Black Star to your inventory via console (player.additem 63b29 1) and then dropping it. Once dropped, both the Black Star from your inventory and the Star stuck to Malyn should be next to each other. 10 Aranea, a priestess of Azura, says I am destined to find "an elven man, who can turn the brightest star as black as night." She believes he is in Winterhold. 30 Nelacar has told me that his old mentor, Maylyn [sic] Varen, was experimenting on Azura's Star. Malyn's last known location is Ilinalta's Deep. 50 I have Azura's Star, but it's been corrupted by Malyn Varen's magic. I could take the Star to either Aranea or Nelacar to have it repaired. 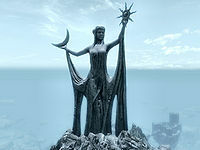 70 I am inside Azura's Star and must defeat Malyn Varen's soul in order for Azura to purify the Star and bring me out. 75 I am inside Azura's Star and must defeat Malyn Varen's soul in order for Nelacar to bring me out and complete the Black Star. 100 Finishes quest I have cleansed Azura's Star, the infinite Soul Gem. It is mine to do with as I see fit. 110 Finishes quest I have completed the Black Star, an infinite Black Soul Gem. It is now mine to do with as I please. DA01: 0, 25, 57, 58, 60, 80, 90, 95. On the PC, it is possible to use the console to advance through the quest by entering setstage DA01Intro, DA01 stage, where stage is the number of the stage you wish to complete. It is not possible to un-complete (i.e. go back) quest stages, but it is possible to clear all stages of the quest using resetquest DA01Intro, DA01. This page was last modified on 23 March 2019, at 07:31.